Home > Misc > Can Light Rail Carry a City’s Transit System? We often think of light rail as a single component of a larger transit system, but if it’s done right it can just as soon serve as the foundation. Since 1981 a dozen American cities have built light rail lines atop bus-only systems. In five of them – Dallas, Portland, Sacramento, Salt Lake City, and San Diego – light rail now accounts for at least 30% of all transit ridership in the metropolitan area, even as it covers less than that much service space in the region. 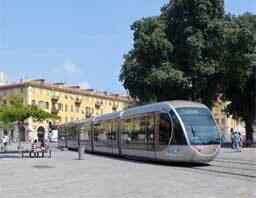 The Nice tram on Place Garibaldi in Nice, on the French Riviera. The tramcar uses onboard nickel metal hydride batteries to cross this historical square. Transit researchers Gregory Thompson and Jeffrey Brown of Florida State, known for their espousal of multi-destination transit systems, recently took a closer look at these light rail systems to determine what characteristics define the best of the best. In a recent issue (PDF) of the Journal of Public Transportation, Thompson and Brown identify two of these backbone systems in particular – Portland and San Diego – as far more efficient than the others.